Credit: Hubble Space Telescope. NASA, European Space Agency (ESA), and J. Hester and A. Loll (Arizona State University). An international team of astronomers has accidentally spotted the first space molecules bearing a noble gas, argon. The surprising discovery, in the debris of an exploded star, reveals the element's isotopic composition, confirming long-standing predictions that argon is forged in such doomed stars. Once called inert gases, the elements in the final column of the periodic table have closed outer shells of electrons that normally prevent them from exchanging electrons with other atoms to form molecules. In 1962, however, chemists discovered molecules containing xenon and now call these elements noble gases instead. But no one had ever seen a molecule in space harboring a noble gas, even though one such gas—helium—is the universe's second most abundant element. 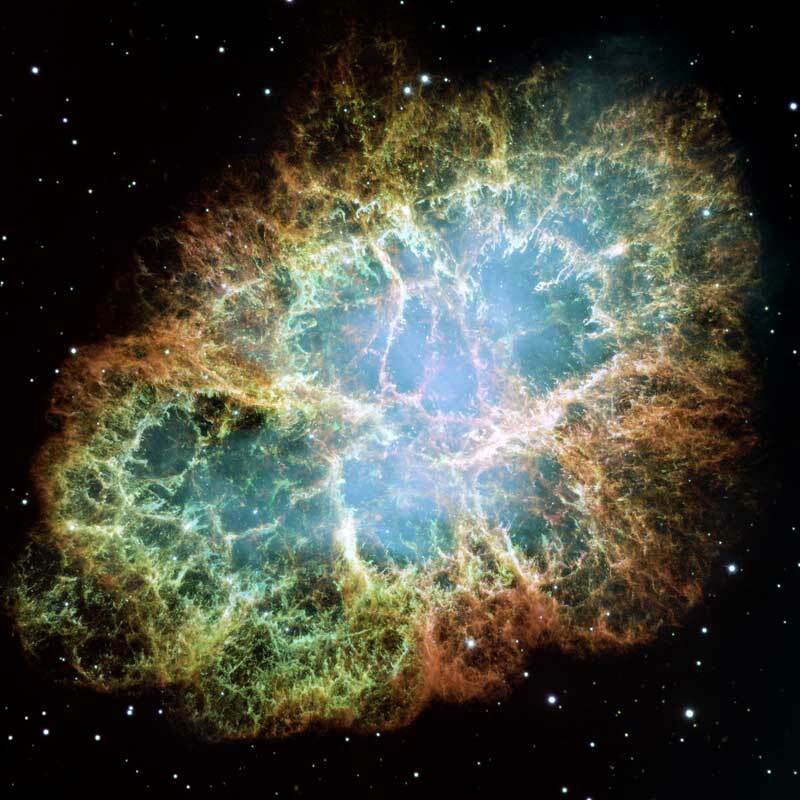 Mike Barlow, an astronomer at University College London, and his colleagues were using the Herschel Space Observatory to study supernova remnants, including the well-known Crab Nebula. It resulted when a massive star 6,500 light-years from Earth in the constellation Taurus ran out of fuel, sparking a brilliant explosion that our ancestors witnessed in 1054. Barlow and his colleagues wanted to observe the Crab Nebula's dust, which radiates its heat at the far-infrared wavelengths that Herschel detects. They also searched the Herschel spectra for lines from common molecules such as carbon monoxide. The scientists never found those molecules. Instead, they saw two mysterious emission lines—one at a wavelength of 243 microns, the other at 486 microns, exactly twice as long. "That was a giveaway that it was a simple diatomic molecule—two atoms rotating about each other," says Barlow. After failing to find a match with common diatomic molecules, the scientists realized that they had spotted the argon hydride molecular ion, whose chemical formula is ArH+. "It was very surprising to us," Barlow says. "Nobody had predicted the molecule. We call the discovery serendipitous to make it sound a bit more scientific, but it was an accident—a lucky discovery." The peculiar molecule probably forms when singly ionized argon—an argon atom with one of its electrons missing—meets molecular hydrogen (H2) and grabs a hydrogen atom. Argon (atomic number 18) is the eleventh most abundant element in the universe and the third most common gas in the atmospheres of Venus, Earth, and Mars. The element makes up 0.93 percent of the air that we breathe. Most terrestrial argon is argon-40, which comes from the decay of radioactive potassium-40 in rocks. But theorists have long predicted that massive stars should manufacture large quantities of a lighter argon isotope, argon-36, which has equal numbers of protons and neutrons. Other astronomers had already detected argon atoms in the Crab Nebula. "But there was no direct proof that it was argon-36," Barlow says, because atomic spectral lines from different argon isotopes have nearly the same wavelengths, making it difficult to distinguish them. For molecules, however, the task is easy, because molecules containing different argon isotopes emit radiation at noticeably different wavelengths. Therefore, the argon hydride molecules revealed the element's isotopic composition: it is argon-36, just as the theory predicts. "It's nice to see cherished beliefs borne out," says astronomer Stan Woosley, a supernova expert at the University of California at Santa Cruz, who was not involved with the discovery. Early in its life, a massive star shines by converting hydrogen into helium, as the Sun does. Then the star begins burning the helium into carbon and oxygen, which eventually forge still heavier elements. Argon arises during the oxygen-burning stage, in which one oxygen-16 nucleus hits another, creating sulfur-32. The sulfur nucleus is in an excited state and usually emits a helium-4 particle, thereby becoming silicon-28. The helium-4 particles strike the silicon-28 and sulfur-32 nuclei to make argon-36 and also calcium-40. Woosley says that the timing of argon's creation depended on the star itself, which astronomers think was born 8 to 16 times as massive as the Sun. If the lesser figure is correct, he says the element originated primarily in the supernova. If instead the star was born with the larger mass, it created most of its argon before the explosion, during the last few months of its life. Massive stars should also produce smaller amounts of another argon isotope, argon-38. If scientists can detect it, they could compare its abundance with that of argon-36. "It's a direct test of nuclear reaction theory in supernovae," says Barlow. He hopes to use ground-based telescopes to search the Crab Nebula for the heavier argon isotope, because the Herschel Space Observatory recently ceased observations. Barlow and his colleagues are publishing their discovery online today in Science.